Knoxville is ostensibly playing a character called D.C. and ostensibly describing D.C.’s semi-youthful days as the owner and operator of a rundown amusement park called Action Point, but it’s pretty clear that he’s really thinking about his less distant but still bygone days as the ringleader of the Jackass TV and movie series, in which he performed stunts so inventively pointless that they sometimes qualified as avant-garde. Even more so than Bad Grandpa, a Jackass-branded narrative-stunt hybrid, Action Point attempts to wed Knoxville’s real-life endangerments with a regular movie plot, a pretty simple (and era-appropriate) underdogs-versus-mean-developers story pitting D.C. and his crew of mostly teenage apprentices against a bigger, safer, more corporate amusement park that covets their beer-can-strewn land. The “shitbirds,” as D.C. refers to his intrepid staff, are joined by D.C.’s daughter, Boogie (Eleanor Worthington-Cox), who visits his broken-down California wonderland for the summer. This material, especially the father-daughter relationship, isn’t stitched to the big-scale slapstick particularly well; there are plenty of sequences that look like hastily constructed detour signs, giving Knoxville the opportunity to shoot some Jackass-y vignettes about, say, capturing woodland creatures for use in a low-budget petting zoo or catapulting himself into a barn wall. He also makes the mistake of borrowing screentime from the appealing younger actors in order to give more material to his buddy, in this case D.C.’s goofball sidekick Benny, played by Jackass alum Chris Pontius with equal parts good nature and tedium. Actually, make that slightly more tedium, because many of Benny’s jokes are verbal, rather than physical, which is not a strength for Action Point. Especially in the early going, the dialogue from and around Knoxville is full of pauses, as if waiting for the director to give the “moving on” signal. Yet that director, TV veteran Tim Kirkby (Brooklyn Nine-Nine and Veep, among others), doesn’t just prod Knoxville from stunt to stunt. Those transitions are often bumpy, but the individual sequences are shot with a keen eye for large-scale slapstick, both in their capturing of Knoxville’s marquee pratfalls (he has dutifully/pridefully cataloged his various real injuries in interviews) and framing smaller sight gags, often in the background of a pleasingly busy, sometimes anarchic frame. The structure may be flimsy, but maybe that’s by design; damned if the on-screen Action Point doesn’t genuinely resemble a popular dirtbag hangout spot, complete with children running wild (sample kiddie-land attraction: kids smashing an old car with baseball bats), lazy all-day swimmers, and a guy who roams the grounds looking to pick a fight. Kirkby gives the whole operation a magic-hour summer sheen, clearly contrasting with the antiseptic whites of the house where an elderly D.C. narrates the story to an adult Boogie’s own daughter. The flashback device adds little beyond that contrast. 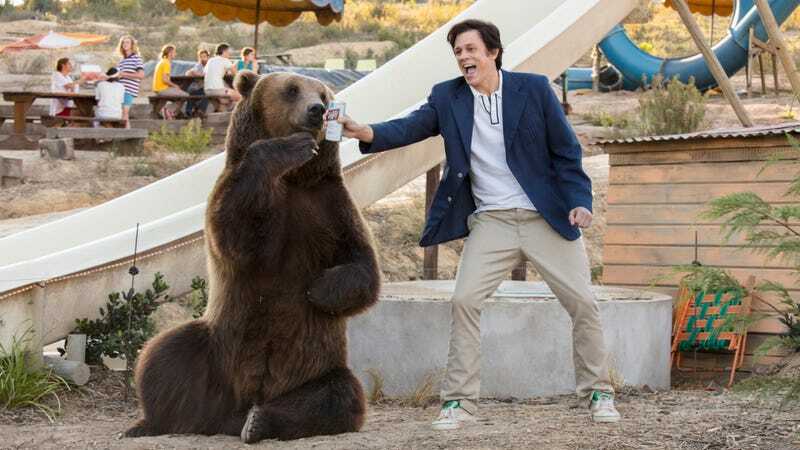 These and other lulls make it difficult to fully recommend Action Point, but moment to moment, the movie is often funny, both as a series of gags (D.C. makes a new ride blueprint in flipbook form) and a series of fond riffs on the nightmare stories from its clear real-life inspiration, New Jersey’s own Action Park. Action Point’s nostalgia sunglasses are tinted, but not as dark as they could be, and certainly not clear enough to offer a look at any subtext, even when it’s right in front of the filmmakers’ faces. Knoxville seems to think he’s pining for a simpler time; what he’s actually depicting is closer to a snapshot of a Me Decade narrative where the youthful counterculture slides into aimless pleasure-seeking, with kids willingly mutilating themselves in the name of fun just to feel something. 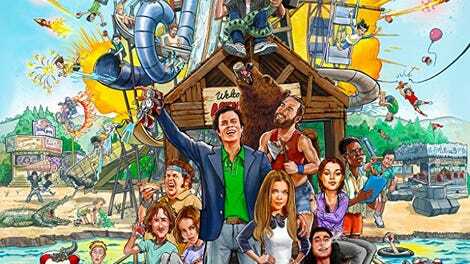 Although its resolution is admirably non-fantastical, Action Point is ultimately more interested in telling a story about a pretty nice dad who becomes a somewhat nicer dad. Turns out there’s more than one way to get safer with age.